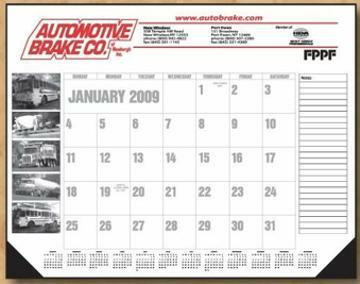 Custom Desk Calendar Pads Personalized in Bulk, 22"x17". w/ Vinyl Corners, and Clipboard Back. Promotional, Low Cost. Budget Prices for USA, Canada. Personalized large desk calendar pads with vinyl corners at bargain prices. Typical Production Time: 3-6 weeks. Contact us if you need a rush delivery of our custom imprinted large desk calendar pads. Free artwork design. 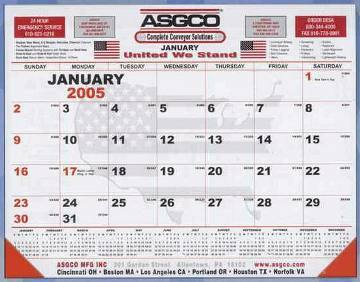 Budget Prices for USA, Canada for wholesale personalized desk pad calendars. American clients pay no taxes. Imprint Color: any. Please add $30.00 per color, if you need an exact PMS match. Prices include your 1-color custom imprint. Add $0.57 per calendar for each additional imprint color. Optional Phantom (Faded) image in the center (see photo): add $39.00 per order. Custom Desk Calendar Pads features. You may specify the starting month! Imprint Size: 20"x3". Free 3"x 10" optional imprint on either or both sides! See photo, please specify on the Order Form under "Special Instructions". Optional Phantom (Faded) image in the center (see photo): add $24.00 per order. Calendar Colors: Red & Black (see photo), Red & Blue, Gold & Blue, Black & Gray, Blue & Gray, Maroon, Blue, Light Blue, Black: please specify, same price. The 2 color calendars have the Sundays and Holidays highlighted in a different color. Production: 15-20 days after art approval ; contact us for faster delivery. Please check also our super economy desk calendars with imprint on vinyl.